Stellar Planet: Look around you: what do we really know about the Milky Way? 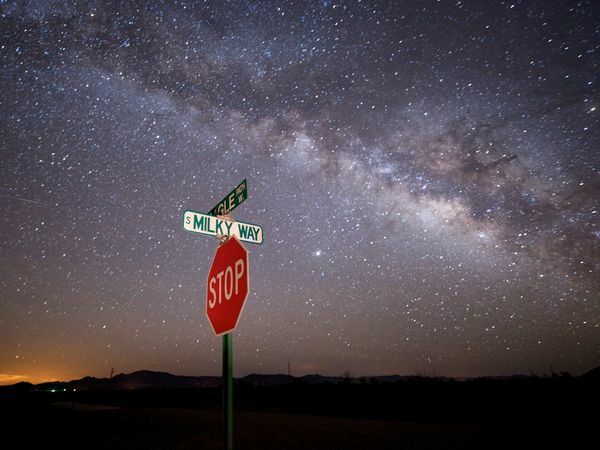 Look around you: what do we really know about the Milky Way? Look around you, just by observing the room you are sitting in or what you can see outside the window could you describe what the building looks like from the outside? This is the same situation we are in with our own galaxy, the Milky Way. Sitting at the edge of the room looking around us and attempting to work out the structure of the building. On a clear night away from the light pollution of civilization you can see the galaxy stretched from east-to-west across the sky, the centre of the galaxy obscured by dense gas and dust. The Earth and Sun sit on the edge of galactic suburbia in an outer spiral arm called the Orion arm roughly 27,000 light years from the galactic center. All of the stars that you see in the night sky are part of the Milky Way, which contains up to 400 billion stars. So what does the Milky Way look like, what is its shape and structure? Believe it or not we are still not completely sure. 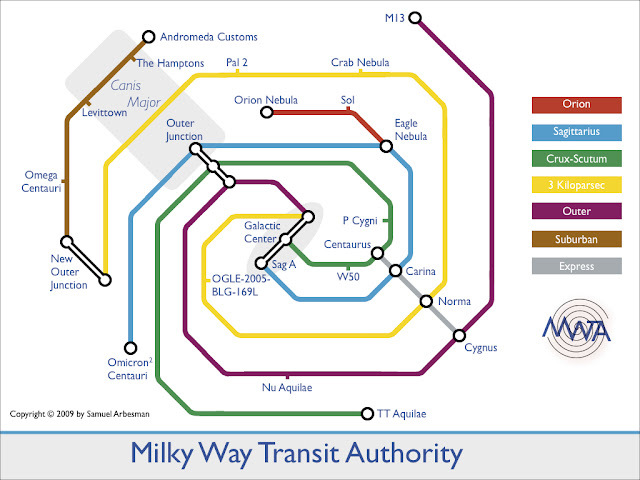 The diagrams of the Milky Way that we see are actually based on other galaxies that we can see in the sky. 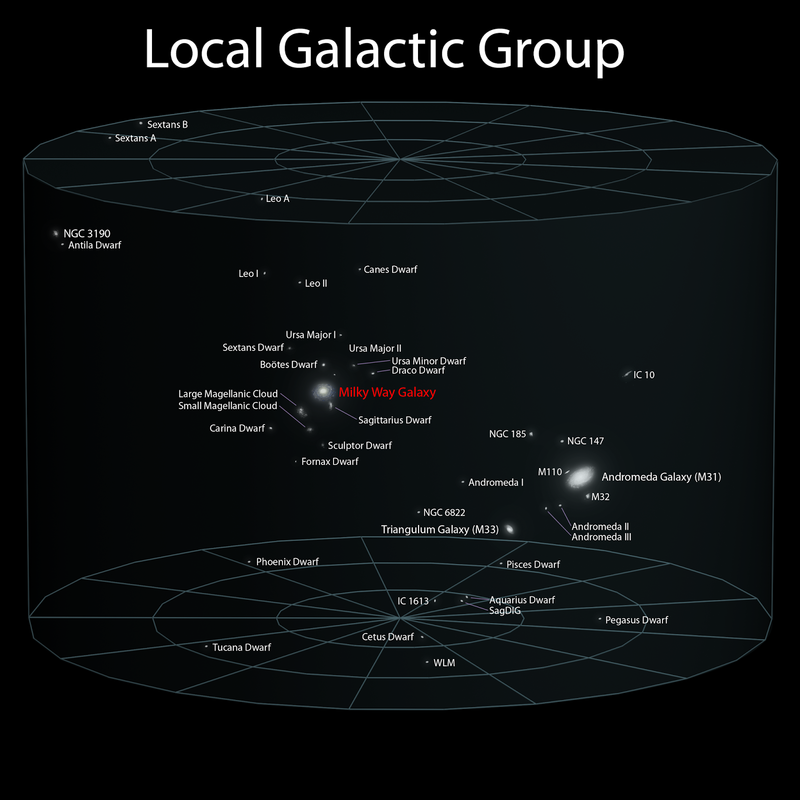 If you look in the night sky you can actually see some of the galaxies that are part of our local group. Two of our closest neighbors are clearly visible from the southern hemisphere, the Small and Large Magellanic Clouds, are satellites of the Milky Way. These satellites sit at a distance of 197 and 164 thousand light years away with each containing several hundred million stars. These, however, have irregular structures and are around 1/100 times the mass of the Milky Way. The largest member of the local galactic group, M31 the Andromeda galaxy, is a spiral galaxy like the Milky Way. It is the only galaxy visible with the naked eye from the northern hemisphere despite the fact that it is 2.5 million light years away, though it is getting closer and we are predicted to collide with it in 4 billion years. If we look beyond our local group you can see more and more galaxies filling the blank spaces between the stars looking back through both space and time. 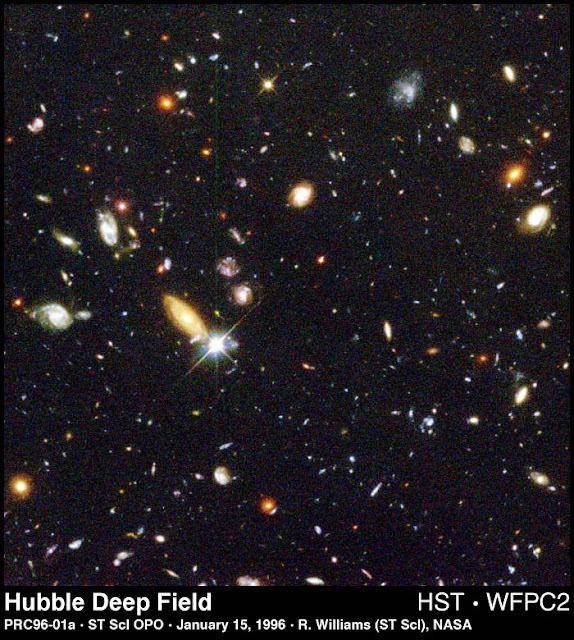 The famous Hubble deep field images revealed hundreds of billions of galaxies all different shapes and sizes and yet with common trends. 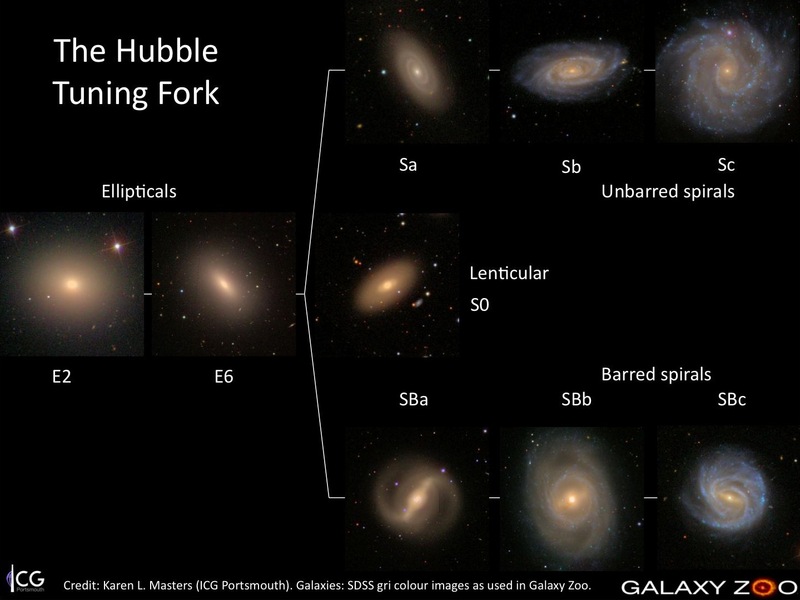 All galaxies seem to fall into a number of types, spirals, barred spirals, and elliptical. So where does the Milky Way fit in? We have looked out the window and seen what the buildings around us look like. Now we need to take a look around the room and determine which one it could be. The structure of different galaxies. 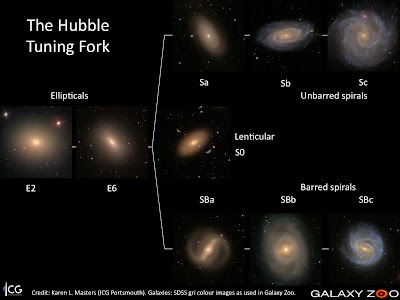 Despite decades of observations the specific spiral structure of our own galaxy eludes us, with questions spanning from the number of spiral arms to the morphology of the central bulge or bar. The spiral structure of the Milky Way was first determined by observing the distribution of the stars in the sky; however, at distances greater than a few thousand parsecs accurate distances are hard to determine. Instead astronomers measure the distribution of different gasses such as CO and HI, which map out the gaseous emission in the galaxy. This by no means solves all of the problems faced by the previous methods used it is still hard to map the opposite side of the galaxy as well as determining the distance to certain features. So what astrophysicists are doing is using simulations to generate synthetic maps of galactic emission to determine the structure of our galaxy. 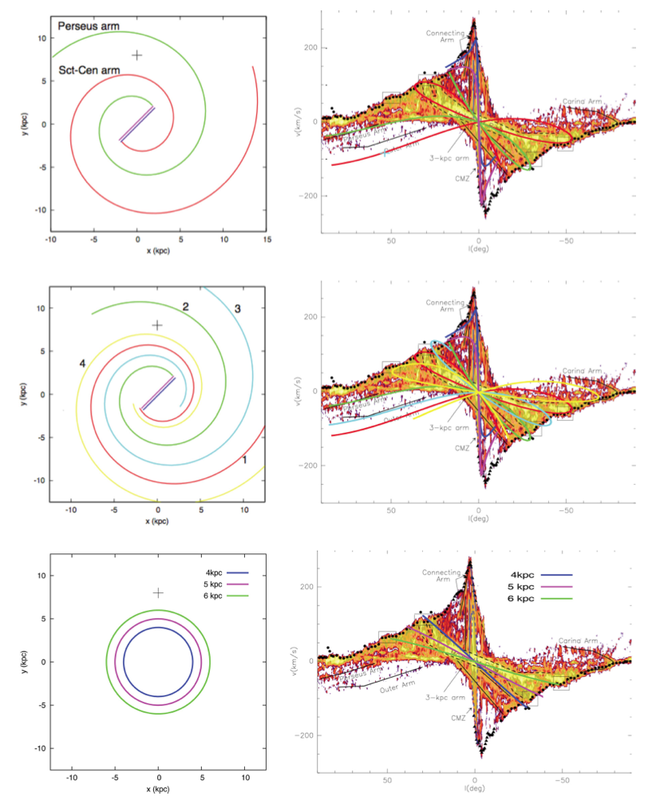 These diagrams show the observed velocity of HI emission verses longitude with the simulated emission velocity over-plotted, the corresponding basic line structures simulated for the Milky Way on the left (from C.L. Dobbs et al. 2012). On the left-hand side are possible Galactic features, a two-armed spiral pattern (top), a four-armed spiral pattern (centre) and three rings of different radii (bottom), with the position of the observer marked by the grey cross. On the right-hand side panels is the location of the spiral arms in a velocity–longitude plot from observations of our galaxy and the velocity-longitude structure of the left spiral patterns on top with the corresponding colours of the spirals (C.L. Dobbs et al. 2012). how fast is it rotating? So while we are trying to work it out perhaps the engineers can get to work on that Faster Than Light drive so we can zip out and have a look for ourselves. Thanks to my friend Alex Pettitt for the inspiration for this post as he is one of the poor researchers set to explore this parameter space for his PhD. Also he is much better at explaining this than I am so post any questions and I can see what he says. Also if you want more information check out these papers and click on the linked segments of the main post. Also if you are an engineer get to work on that FTL drive, everyone will thank you.